This is probably one of my most favorite giveaways that I have done here on the blog! Today we are giving away an Accuquilt GO! Baby Fabric Cutter PLUS three dies of your choice to one very, very lucky The Cottage Home blog reader. Pretty cool, right? I love this sewing/quilting tool and I know you will too! In case you missed my previous post about the girls appliqued shirts that I made recently. Here are some pictures of several of them that I made using my own Accuquilt GO! Baby Fabric Cutter….. So, would you like to win your very own GO! Baby Fabric Cutter with three dies of your choice? 1) Leave a comment letting me know what you would make with your GO! Baby Fabric Cutter. 2) Become a follower of The Cottage Home blog (follow via Google Friend Connect in the left side-bar of the blog). 3) Become a fan of The Cottage Mama on Facebook (click HERE to sign up). 4) Sign up to receive 22 FREE Patterns from Accuquilt (click picture link below). Giveaway is open to US residents only. Winner will receive one Accuquilt GO! Baby Fabric Cutter plus three dies of their choosing. Giveaway open through September 29, 2011 at midnight (CST). Finny and Zook Giveaway Winner! 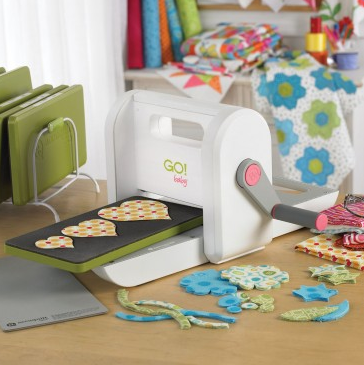 Love this Go Baby fabric cutter. I would use it to add to a quilts I am make for my nieces. I would use it to add to my kids and my clothing. Just about anything with or without fabric this little machine will be used! I would use the accuquilt fabric cutter to make a quilt for my cousins little 5 yr old daughter. She is dieing of cancer and wants a homemade from me and i think that would be neat to put some puppys and kittys or bird on it. I signed up for the free patterns from Accuquilt. 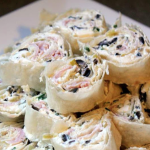 I am a follower of your blog and with this accuquilt Go! 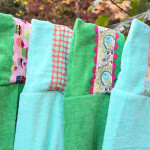 Fabric Cutter Giveaway I would do appliqués everywhere (shirts, pillows…). Thanks a lot for this chance! Well… I’ve been thinking I should go ahead and make some quilts for my little ones so I probably would use it for that. Oh and t-shirt embellishments, pillows and all sorts of other fun stuff! Follow and love your blog! Let’s see… I subscribe to the blog through my Google Feed Reader – but I just did the Google Friend connect thing too 🙂 I refuse to jump on the Facebook bandwagon so I’ll have to skip that step! and I signed up for the free patterns! I’d love to make matching appliqued shirts and dress for my 3 year old and baby too be. So fun! I am so excited about this giveaway that you are doing. With the Baby Fabric Cutter I would be making my son stuff all the time. With him I tried to find specific things to put on his shirts depending on the occasion and it would be so much easier if I could just make them myself. Plus we are trying to have a baby so it would definitely be put to use in the future once we have the baby. cute! i’d use this for making cute shirts! How many times have I wished for this little machine as I’ve made gifts for friends, clothing for my daughters, etc. There are so many fantastic uses! Thanks for this lovely give-away! I would make appliques for blankets with this. Great giveaway! Dude I totaly would dress up my girls clothes!! Soo cute! I like the cottage mama on facebook! I would definately do more applique if I had a Go Baby machine! I do follow the Cottage Mama blog! already signed up for Accuquilt and the free patterns! I signed up with Accuquilt! I have been wanting to make a yo-yo dress, the circle die would be perfect for this. Thanks for the opportunity! Oh, I so want to quilt. I think I can handle the sewing part, but I’m worried I can’t cut:-). Check – signed up for the free patterns! Thank you! I would make t-shirts and cut strips and HST for quilting if I won! I would use the Go Baby mostly for making cute outfits for my kiddos and for quilts. Thanks for a sweet giveaway. Yep, I’m a fan on facebook too. I follow you and you’re on my Google reader! I love the little shirt appliques you made for your daughters! Maybe I’d try doing that! So sweet! I’ve already signed up for the free patterns from accuquilt. I’m a fb fan!!! Wahoo! I’m a new blog follower! I downloaded the free patterns..They look awesome! Thanks for a great give away! Appliqued shirts, pillows, quilts….oh the fun!!! I followed Cottage Mama with GFC. i would use it to make tshirts and quilts!!!! I signed up for the AccuQuilt newsletter. I have a circle quilt in pintrest I really want to make but I can’t cut out perfect circles! I *need* this! Thanks for the chance! …and I follow your blog and LOVE IT! Thanks again! I have SO many quilts in mind to make. Would love this!!! I would love to use it to learn quilting. Since I am a quilter, I would probably just be cutting boring old squares, triangles and strips! I signed up for the news letter and downloaded the patterns. They have so many patterns that I love. I really hope that I win this, there is just so much that I could do with the fabric cutter that I have been wanting to do but didn’t have the tools necessary. Oh and on facebook I have been a fan of yours for a while. I subscribed to the AccuQuilt emails. And that will be it for me as I don’t ‘do’ Facebook. I’d definitely use it to make quilts with patterns I hate cutting — like drunkard’s path. The more accurate question would be, what would I NOT use it for, lol! Truly, I would probably use it most often for appliqué for onesies or children’s shirts. So very cute!! I want to get the tumbler and flower dies and make a really cute potted plant quilt or wall hanging for spring. Way cute!! I have signed up with Accuquilt and downloaded the designs. Hi Lindsay! I do a lot of applique already, and this would make it SO much easier! I love to make clothes, burp cloths and banners. I signed up for the free patterns! Oh my gosh! I would be sooooooo thrilled if I won this amazing piece of equipment! Crafting is my absolute favorite past time. I make baby blankets for all baby showers and new babies. Embellishing blankets with names and fun appliques is a blast and this would definitely help!!! I would make baby gear galore!!! Onesies, blankets, Tshirts (like the ones you did), etc! You name it!!! I would also use this to make some matching clothes for mama and baby and to decorate and make laptop clutch cases!!! So many things!!! I have been following you on Facebook for a few weeks now! I found your blog onling and LOVED so many of your tutorials! I plan to make your turkey onesie for my two sons and all the cousins for Thanksgiving! I can’t wait!!! I’ve love one of these as I like to appliqué but and rubbish at cutting with scissors! What an AWESOME giveaway, Lindsay! I would love to win this one, have been eyeing the GO for months, but can’t justify buying one. I’d love to do more applique, but also love that there are dies for quilting! Cutting small pieces for quilts can be such a pain, this would make it so much faster! I’ve also joined your Facebook page! Love this giveaway! I would make my daughter a denim jumper with an applique on the bottom corner…so many possibilities. I signed up to receive the emails! 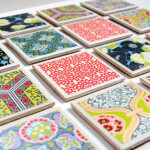 I am a fan of cottage mama on facebook! I have the free patterns! Thanks for the chance to win! Oh so many projects come to mind for Halloween and Christmas t-shirts and outfits for my boy and girl. Thanks for the giveaway. I would definitely be making some girl’s shirts for my store! I’ve been dying to have one of these! I would make tons of applique quilts! I already follow you on facebook. I have to keep up with your awesomeness! I like the cottage mama on facebook. Have been following on facebook, too! Signed up for the 22 new patterns! I hope I win! I already signed up for the newsletter and free patterns. I would learn to make a quilt…have always wanted to!! I follow you…love your blog!! I like the Cottage Mama on FB!! Ahhhh!!!! I’ve been waiting for this…let’s hope I’m the winner!!! I would spice up my girls’ shirts and onesies, of course. And possible make some for my etsy shop. I would decorate my little girls bags with the cutter! I would love to decorate plain t-shirts as gifts, and make some quilts covered with appliques. This would make it so easy! I would add fun designs to their hooded towels and maybe make some fun throw pillows for their room. I quilting item I have not gotten yet!1 I would love one of these for making quilts for my grandchildren. What a lovely giveaway! I’d definitely use one of these for quilting and appliques!!! I would decorate T-shirts for my grandchildren, gift items etc. Thanks for this giveaway! I’ve been following your blog ever since I used your party dress tutorial to create my two girls’ Easter Dresses this past Spring. I have created a few things based on your tutorials since then and love it! Your blog is so genuine and creative. I would love to try out the accuquilter to use to make appliques for my girl’s plain denim dresses and jeans and also on a few quilts I have on the back burner! Thank you for this blog. I would just love one of these…I just got into quilting and applique. I would love to make quilts, applique for onesies, sooo many different things! I would love to use the Go! Baby to make onesie appliques. I think it’s just so precious to make them more personal! And I definitely signed up for the free patterns! I love this! I would make tons and tons of blankets! I follow you on Facebook. I would love to make fun appliques for quilts and things for my two sweet little girls. When I originally saw your post with the adorable shirts you created with the GO!, I decided I had to have one. I’ve been watching a few on Ebay. But to win one? Yes, please!! I am now a FB follower! What wouldn’t I make with it?? I love the possibilities with appliqué to liven up plain shirts, etc. but I also think I’d get a lot of use out of it for quilting and making bias tape! I’ve signed up to Accuquilt. I am also a follower of the blog… I SO want the Go Baby! I would use it for quilts & add it to throw pillows, etc!! I’m a big fan of applique, so I would use the cutter for embellishing dresses I make my girls. I would also love to use it for quilts. I signed up for the 22 free patterns in hopes of winning! i signed up to receive 22 FREE Patterns from Accuquilt…hoping to win. I have been doing sewing and embroidery for many years, but have never done much applique. This would be a great way to bring applique into what I currently do in quilting and sewing for children’s clothes! Great giveaway! Thanks for the chance to win! I am a big follower! Love ur blog! I would for sure applique a couple of those cute shirts for my daughter and niece but would get busy on a quilt for a my adorable little grandson for Christmas. Hope you and your new little one are doing well! I am a fan of The Cottage Mama on Facebook. Awesome giveaway!! Just found out I’m going to be an aunt for the first time! Can’t wait to make some adorable onesies for the new little one : ) This would be perfect for making appliques! Oh, pick me! Pick me! I’m a follower! Thank you thank you – I would make lots and lots of hexagons and squares for some funky quilts!! I would love one of these. I usually end up free handing my appliques and I am a horrible drawer. How easy would this be. Thanks! I’ve been doing a lot of applique quilts recently, and this would be so helpful with that! Hooray! I’m already a fan on Facebook. Hope I win! Oh goody! What a great giveaway. I have done all three needed steps! I would love one of these for my felt projects! I “like” you on facebook. I’m a new reader, and am enjoying your blog! I’ve been following your blog for a while. Just “liked” on Facebook. This little machine is so versatile – strips, blocks, shapes – OH MY!! I have a circle quilt in mind for a baby quilt and boy, would this fabric cutter should would make things faster and easier! Would love to win. Thanks for the giveaway. I’m already a follower of your blog. Thanks for the giveaway. I’ve signed up and received the 22 free patterns from Accuquilt. Thanks for the giveaway. Oh wow, the posibilities are endless,but I would start with making some tshirts for my daughter. thanks for the chance to win! Hi Lindsay, what a great giveaway! Thank you so much for sponsoring it. I would use it to make appliques for my handmade coffee sleeves. It would certainly make my job a whole lot easier since I currently cut each applique by hand. I signed up to receive Accuquilt’s patterns. I would love to use this to embelish quilts and spruce up some of my girls’ clothes! I’ve never made a quilt before, but this would definitely get me started! I am a fan of Cottage Home on Facebook. I’m a Cottage Home blog follower. I would love to use it to make quilts and applique shirts for my little boy. I would make anything and everything…starting with some neat bags…. I’ve been a fan of yours on facebook! I love to make zip pouches with a big applique in front finished in blanket stitch. What an awesome giveaway! I have been wanting one of these so much! I think the first thing I’d make is to embellish some shirts and onesies like you did; then, the options are just endless! Thanks for the chance! I would make girl clothes! I just have so many projects that this would be great for especially my kids clothes. I could see myself using this everywhere! I would applique bibs, aprons, pillowcases, dresses, and of course t-shirts! I signed up with accuquilt, am already a fan on facebook, and follow your blog. Hmm, I see handbags, boy tees, and baby blankets in my future-the possibilities are endless! This would be a great crafting item. I’d love to make lots and lot of shirts! Thank you for the opportunity! Whoops – my email is [email protected]. I just posted above! Thank you! I would love to make a drunkard’s path quilt. I’m a follower of the cottage home. Hi Lindsay! What a great giveaway! I am making appliqued pouches, for my family Christmas gift.. typically I have to come up with 15 of a similar item to exchange with the extended families that come together during the holidays. This would seriously expedite the process! I would LOVE to win this! I’ve been drooling over it for a while 🙂 I would use it most to cut out strips, but I’d also love some of the fun dies for appliques! I’m already a follower of the cottage home! I follow your blog thru my yahoo reader. 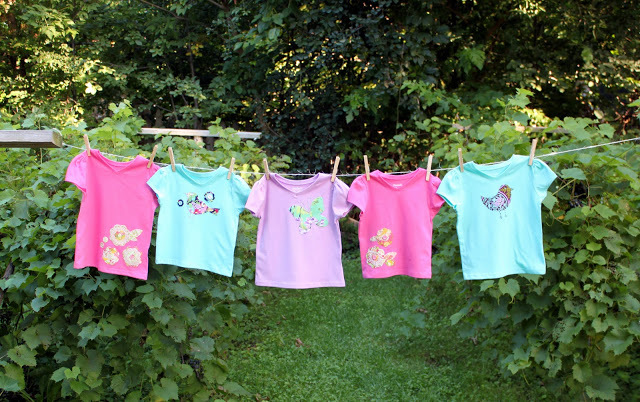 Hey Lindsay, I think I would use the cutter to do applique shirts for my girls! I would love to have a Go! I would decorate t-shirts for some of the young girls at church who can’t afford a lot of clothing, plus some onsies for the babies. And I would love the hexie die for quilt projects. I signed up for the Accuquilt newsletter and patterns. I am a follower of Cottage Home – love the projects you feature! What a great little machine! I already make shirts but this would make things so much easier. I love your little bird shirts you made! I am a FB fan now too! I would use it to appliqué on quilts and onsies/shirts. Sooo cute! I follow your blog… Via google. Connected via Google Friend Connect. I have a tote bag that this would embellish nicely! I’d make some applique shirts like you did! My daughter is going to be a butterfly for Halloween and I need to make her a purple butterfly shirt. This would make that task easy! I have been wanting one of these!!!! I would use it the most to applique on my girls shirts, (cover all the stains on their shirts) But I also want to make them both Christmas quilts. I love your blog!!! And i would make lots of cute applique shirts!!! I would use it to make my first quilt! I am also a facebook follower – that’s how I found out about this fantastic giveaway. And I got all of the patterns. How exciting! Thank you so much for having such a lovely giveaway! Awesome give-a-way. Please count me in. I would love to have one to use for my granddaughter who is just turning 1 year old. Thanks. I did sign up for the new free patterns from Accuquilt. I would make clothing, burp cloths, sachets, quilts, and hair accessories! I would use this to make appliques. I’ve done some reverse applique but never the regular kind, since I’m much better at sewing shapes than I am cutting them :)It would be a great way to add some flavor to a T, a pillow, or anything! I would definitely make my first QUILT with the GO! Baby Fabric Cutter. I have wanted one for so long! I am a follower of The Cottage Home blog. OBViously! I would make 2 1/2 squares effortlessly! I am a FB fan and follow your blog. 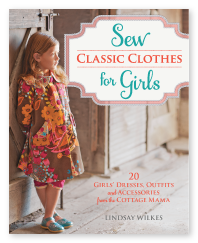 I love your style of little girl outfits, dresses, and home projects. I would use the cutter to cut out appliques for shirt, onsies, and other outfits I make for my little ones and gifts. I would also love to use it to start a kids quilt sometime! I “Like” The Cottage Mama on FB! I would make some fun with an Accuquilt Go! Baby Fabric Cutter and three dies! My daughter and son would have some adorable newly decorated clothes, and I might even try my hand at making a quilt or a pillow. Hope you pick me! I would embellish t-shirts and skirts. I would make clothes and room decor things with this. It would be great for quilts too. If I won, I would make a quilt! I signed up to receive the free patterns! And I already downloaded them! I follow your blog via GF. 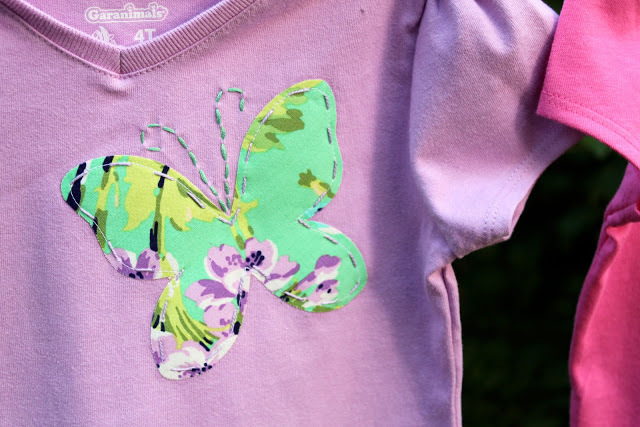 I think I would embellish shirts for my baby girl… looks si easy and cute! I became a follower with google! I ‘liked’ on facebook… my initials are E.P. I would make flowers for my little girls hair! 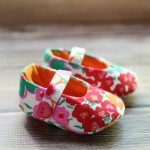 I would love to have one to make my fabric flowers as well as do applique for my girlies clothes! Thank you so much! I follow your blog via GFC! Thank you so much! I signed up for free patterns too! Thank you so much! Oooh, I would make appliques for clothes, mostly – maybe work on some quilt appliques, as well, since my piecing skills are pretty minimal. I’m a regular reader! Thanks for the chance! I have two little girls too, so I would start by embellishing all of the winter clothes I made for them with cute little cutouts, like the cute little shirts you made for your girls. I LOVE the idea. Thanks for the creative inspiration! i would make some really cute onsies for all my friends having babies (4 on the way) and to add to my quilts. I would applique lots of tops for my grandchildren. I am a folower of your blog. I liked Cottage Home on Facebook. I subscribed to Accuquilt.com and the free patterns. I would make decorative throw pillows for my girls bed and decorate some much needed nightgowns! Oh this would be so fun to have. I can just imagine all the cute shirts/dresses I could applique. I would use it for appliques on clothes. I signed up to receive the free patterns. Now I just need a machine! Would be so grateful to win this! I would make cute onsies for my baby’s friends! I would make pillows and quilts and ohhhh, maybe some appliqued onsies for all the babies arriving in our church soon. I would love to win the accuquilt and make some adorable clothes like you did, except for my little man! I’ve always wanted to get into quilting, so this would be a great incentive. I follow the Cottage Home blog! I am a fan of the Cottage Moma on FB! I signed up for the 22 free patterns at Accuquilt!! If I won this cutter I would use it so many ways, don’t know specifics yet. This would be awesome. I ‘like’ you on Facebook (though with the new format I’m not sure how to find the Most Recent!). I would use the Accuquilt GO! Baby Fabric Cutter for making matching tops to all the skirts I have made. I would definitely use it for appliques for gifts, and maybe, just maybe to make some little teeny baby quilts! I am not sure where I would start, but the ideas are endless. I would applique shirts for my 2 daughters, add some pizazz to gifts for friends, and make the first quilt I am making for my 4th child so much more creative than this beginning sewing mom could ever do on my own! I would use this to make quilts for my 4 grandchildren! I love your blog!! I would use the baby fabric cutter to make adorable things for my first niece or nephew due in April!! I cannot wait to sew all kinds of new projects for the little one! I would quilt and applique. What a great giveaway! I am a new quilter and I would use it to make quilts! I would use it to make shirts for my kids. I would also use it to make crafts. I would use it to decorate baby blankets for our baby dedications at my home church. I’ve been looking at one of these and wanting to buy it so bad!!! Putting it on my wish list!!! I have a 1 1/2 year old niece that I love to make things for, and I would use this machine to make things for her!!! I want to use it to make fabric flowers and embellished tees for my daughter. We’re expecting baby #3 and I would embellish some sweet little onesies for our baby-to-be! I would LOVE to have this nifty little machine. I would make some skirts for my daughter and embellish them! Hope I win this! I follow The Cottage Mama! I’m a follower! Love your blog! I would definitely use it to make cute shirts for my kids! I’m sure they’d look a lot better than the one’s I cut by hand! Wow, I would so love to win this! I make appliqued shirts for my kids, and as gifts, really often, so that’s probably what I would make. It would make it so much easier! I was following you in my google reader, but did the google follow thing just now. I am a fan on your facebook page. If you need to verify, I will be happy to provide my profile name. I signed up to receive 22 free patterns from accuquilt. If I was lucky enough to win the Go! Baby fabric cutter, one of my main uses would be to make dog and cat toys. Right now, I order pre-cut pieces from other places, but I would LOVE to be able to cut my own. I’d also like to be able to do little appliques on dog clothes. I would make cute little outfits for my nieces for Christmas. What a fabulous giveaway! I would make some appliqued shirts for my kids too. This would make it much easier. Thanks! Hello! I am a current follower of your fun blog 🙂 Thanks for your generous offer to win the GO! cutter. I signed up to download Accuquilt’s 22 free patterns! I “like” The Cottage Mama on Facebook. They should offer a “love” button, tho 🙂 Thanks for the chance to win ! Thanks for the giveaway opportunity! I would use the fabric cutter for appliques on my lap quilts. I would love the chance to use this cutter system for embellishing t-shirts, totes and pillows ! Also, I would get the CIRCLES to reduce my cutting time for making FINGER PINCUSHIONS!! (can you get carpal tunnel from scissor overuse ?) Hubby and I make oodles of pincushions. Oh, I would do so many of these darling appliques—and maybe go for a QUILT! Congrats. I was rooting for you to have a VBAC. I had a baby boy three years ago thru C sec . I am sure the girls are enjoying their little bro. Thanks for this lovely giveaway. I am getting into the world of quilting (modern). This little gadget will come in handy. What would I make? The possibilities are endless…probably some adorable appliques for my twins’ clothes and shoes. I would make appliques on clothing like yours and maybe I’d even be brave enough to make a quilt. Follow The Cottage Home via google reader. Some shirts for my kiddos! Like the Cottage Mama on facebook. If I had the Go BabyI, would add some cuteness to my kids clothes. would so love to win this!!!! i have been collecting fabric remnants for a while now to make a quilt and it seems like it would be so much easier with the accuquilt. So many options… But I would crank out charm squares. Love to use them, hate to cut them. I would use this baby to make cute tees for my girls, like you did. I would like to make some of those cute shirts for my daughter! I’ve signed up for Accuquilt’s newsletter. I already follow through gfc! I’d make an applique tree on a quilt top. Well, I am making it anyway, but I would wait for the perfect cutting tool. I would make loads of appliqued shirts for my little girl! I would love to have the Baby Go to do fun embellishments on totes and grands clothes. The Free patterns from Accuquilt were fun to check out. Love the free patterns on their site also. I am a fan on Facebook also. Wow!! This is an awesome giveaway!! I would love this, for all the quilting applique projects, I’ve been dreading!! I’m also a follower on facebook!! I’d love to make matching appliqued shirts and dress for my 3 year old and baby too be. can’t wait….. I would use the Baby to make quilts and appliques. I have been wanting one forever! I like Cottage Mama on FB! Oh I want one of these! I would make baby things, and quilts, and more baby things, and…the list goes on. Thanks! I’ve been drooling over this, I’d be thrilled to have one! I’m a follower now- I can’t believe it took me so long! I saw some holiday dies that would make some fun table runners and tote bags. I’m signed up at accuquilt for the patterns. I’m a fan on facebook of The Cottage Mama. I would use the cutter to embellish my daughter’s outfits! So much fun! I also signed up for the newslettler and free patterns! I gotta get sewing! Christmas is coming so gift giving is a must so let the gift making begin. Lots of tshirt and pj construction would be at the top of the list for me. I would definately use this for making appliqued shirts for my kids! And it would make fabric flower clips so easy too! appliques for the new baby boy are in order! as are hexies for a quilt. what a great give away, iwant to make quilts for my grandchildren and this would be great. I would use the Accuquilt cutter for cutting the applique pieces for a quilt I have been wanting to make for years but never have because of all the cutting involved. This would help so much making all the items I’m trying to sale. Would use it for sure…Love the tee shirts. Have been a fan on facebook. I signed up for the free patterns/newsletter from Accuquilt as well. 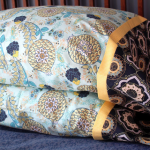 Have already signed up for free patterns with Accuquilt Cutter, just dreaming! 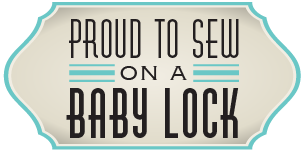 I would use this to make designs to put on my 6 month old daughter…I have been in full baby dress sewaholic mode! Thanks for the giveaway….I love your work! I signed up for the quilt patterns. I love to create! I could use this for so many things. Signed up for the patterns. I would love to win the GO! baby fabric cutter! A few friends of mine are expecting and I would Love to make them cute items for their babies! I would use it to make shirts for my 4! Girls! I would love to win this, since now I am cutting all my appliques by hand. Thanks for the chance to win. Signed up for the free patterns. Love your t-shirts. Very cute. I enjoy embellishing baby onesies, for gift baskets for wives that deliver when their husband is off at war (part of the Operation Homefront program). Would be fun to make some applique’ quilts too! And I signed up for the free patterns!! I would love to use the GoBaby to make a fabulous birthday outfit and special birthday banner for my little girl…she turns 1 in January! I follow you on Facebook (twitter too). I signed up for the free patterns. 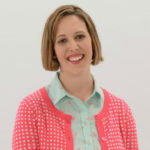 I am following The Cottage Mama blog via Google Friend Connect. I “Liked” The Cottage Mama on Facebook. (cgreenleaf / [email protected]). I’ve already signed up for Accuquilt’s newsletter and received my 22 free patterns. I am a big fan of yours! I love the stuff you make and I am trying to copy some of it. I would make more dresses for my little girl…. I am follower here and on FB. Thanks for this giveaway, it’s really cool. I am a follower of your super cute blog! I LOVE this little machine! I have two little girls and would fill up their closets with matching outfits (while ignoring my husband’s comments on matching outfits . . .). Thank you for the giveaway! I was goign to ask for one for Christmas but…..;) I would make your applique tshirts, flower headbands, patches for my boys knees, the list is endless! Love it! Oh wow, how exciting!! I would make a cute shirt for my son to wear on his first birthday!! I didn’t even know this lovely lil’ gadget was on the market! I absolutely love the birds; a birdy quilt would be the first order of business. My creative daughters- 8,10 – would love creating with butterflies and flowers. Fun,fun,fun! I would use this fantastic machine to add appliques to clothing for my kids and on gifts for family and friends. I am a fan of The Cottage Mama on Facebook. I’m a follower on Google Friend Connect. I’m also a fan on FB!! I’m looking forward to what else you make with the gobaby – I LOVE those tshirts. Cool! I would use the GO! Baby Fabric Cutter to cut cute embellishments for tote bags, pencil cases, etc. If I had a Accuquilt GO! Baby Fabric Cutter I would use it first to decorate clothing for my 3 grandchildren. I would then use it to decorate for Christmas making stockings, tree skirts a table runner, placemats and bunting banners. The possibilities are endless. I would get a lot uses out it and would be so thrilled to win!!! I am a follower of your blog via email and Google friend connect. I signed up for my 22 free pattens. What an amazing give away! I am a follower of your blog and facebook page, and I just signed up for my free quilting patterns. I would use the GO! Baby Fabric Cutter to embellish my two little girls clothes, framed fabric projects and tons more! Liked you on face book. Thank you so much for the opportunity. Love this! I’d use this for quilting, embroidering anything, scrapbooking, and anything and everything I can think of using it for! i would use it to make appliques for my daughter as I want to start sewing outfits for her, and if that goes well, outfits to sell! I’m a follower of your blog via gfc! I’ve signed up to receive the free patterns from accuquilt. I would use this to make cute matching mommy and me shirts. For my daughter and her doll and maybe me too. I would definitely use the cutter to cut appliques! 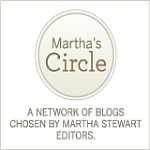 I am a new follower of The Cottage Mama blog! I signed up for AccuQuilt’s email newsletter! Oh to dream of winning this! I’ve been making tops and dresses for my daughter out of cheaper fabric discards I find at stores. Some of the fabric isn’t very cute, but it’s cheap. But I COULD make it cute with little flowers, etc.!! If I were to win I would make table runners for holiday gifts and two quilts hopefully; one for my 3 week old Grandson and the other for our 4yr old Granddaughter. I am already a follower of The Cottage Home. I’ve alredy ‘liked’ The Cottage Mama on Facebook. I’ve also signed up for Accuquilt emails and have gotten the 22 free patterns awhile back. I would love to win this! I could make so many great gifts! Especially with Christmas right around the corner. Signed up for the patterns! I would definitely use it for quilts. There are so many things I could make with this tool. I’d love to use it for mini quilts and applique. I love to applique onesies and things for my grandkids. I would love to win this!! Love your blog and facebook page. I love the shirts you made your girls with the cuts from this machine. Would love to decorate a bunch of shirts form my three girls and two neices. Oh, I would make so many cute clothes for my kids! Then, after that who knows! I’m a follower of The Cottage Home! I’m a fan of The Cottage Home on Facebook! I would use this Go Baby to make baby quilts and to add to accessories. I am already a follower of The Cottage Home via GFC. I am now a Cottage Home facebook fan! I already receive the accuquilt newsletter and have the 22 free patterns. They’re great!! Granddaughter who would love the cute design dies on her T-shirts. I would love the Rag dies. The Flower and Circle, Heart and Star and the 5 1/4 x 8 1/2. Love rag quilts. Liked you on Facebook, following you here and I have the 22 free patterns. Oh so fun!! 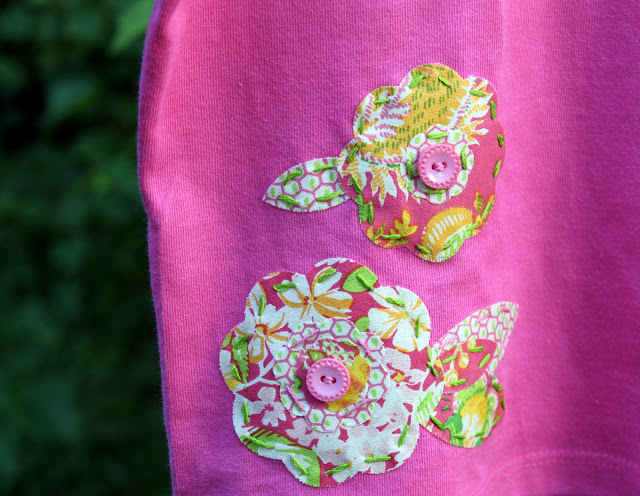 I love putting appliques on clothing…and would love not to cut them out by hand. Love the ones you’ve done. Been a follower…and love reading your blog. Like The Cottage Mama on fb. Signed-up to receive my free patterns. I would love to use it for decoupage jeans! The shapes would be so much fun and easy to do! I would to use it to make myself a new lap quilt for the winter! I would get the 2″ square die and make a pixel quilt themed with an old video game from the 1980s…Donkey Kong! I signed up to follow you! I would make a tumbler quilt or skirt! Oh I want to win one so bad! I would be making cute Tshirts and onesies, as well as many, many, many quilts! I”m also excited it cuts wool so nicely! I’ll be making wool mats and stockings! I”m a new follower! I love finding all these fun blogs! 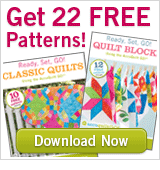 I”ve got the 22 free acuquilt patterns! Now I just need the go baby! As a nurse in an OB unit, I’d use the GO! Baby Fabric Cutter to embellish the clothes and blankets I’ve been making for our little ones that are financially in need. Every baby should gave something lovely. Thanks for the giveaway! If I won I would make a hexagon quilt. I’ve also already signed-up for the Accuquilt newsletter and free patterns. I would love to make little embellishments for mine and my sons clothes. I also would like to take up quilting and I love appliques on quilts! I already follow you on Google Friend. I now follow you on Facebook! And BTW I love your tips and giveaways. Thank you for them! the first thing i’d make with a baby go! would be a quilt, no question! i’m really eyeing the drunkard’s path quilts i’ve been seeing around, accuquilt makes a fabulous die for them! 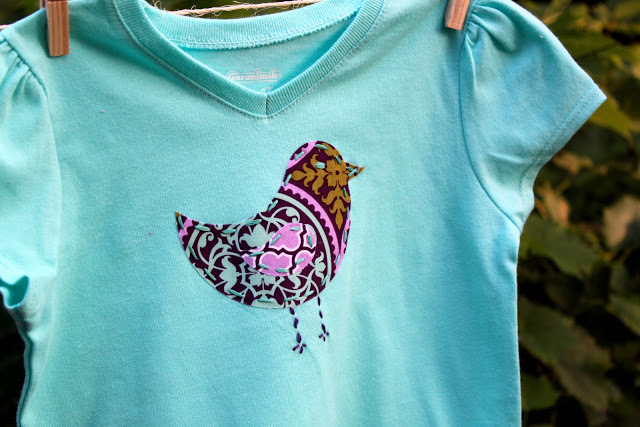 but then i’d start thinking about applique, and about all the other things i could use it for – like ornaments… the bird die you used for the t-shirts would make super cute little stuffed christmas ornaments! and i’m following you via google reader! I would make appliques for the girls clothes, just like the ones you posted. I am a fan of Cottage Mama on Facebook. I signed up for Accuquilts newsletter. I would use the baby GO! for cutting hexagons as a GFG queen sized quilt is my lifetime project. The other dies might be 2 of the following: drunkard’s path, circles, or the value pack. Don’t know if the new multiples will work with the baby, yet if they do, one of those may be a choice. Oh WOW! Talk about a great giveaway! I would love to try making some fabric flowers with the Go! Baby cutter. Or make some cool shirts for my nieces. Thanks for the chance! I already receive the Accuquilt newsletter and downloaded the patterns. Thanks for the link. Love your blog and follow you on Facebook! I would applique onesies for my coworker’s soon-to-be-born bundle of joy! If I won, I think I would start with making appliques for my kids’ clothes and then hopefully to make a new quilt for my bed. Hmm – I commented that I subscribed but it isn’t showing up in the comments…let’s try again…I LOVE your blog! I would love one of these cutters for three reasons. The first would be so I can make cute, unique clothes for our 16-month-old daughter, Lydia. We live in a small town and it’s often hard to find cute clothes that are unique too. It would also be fun to be able to take plain tees, skirts, turtlenecks etc. that are on closeout sales (have to pinch those pennies!) and make something fun! Thirdly, I’m wanting to get into quilting. This would be just the ticket to making small quilts, wall/hanging quilts, or framed cutout patterns. I would love to start my first quilt with the Go! cutter. Thanks for the opportunity!! I’m a follower on your blog – love it by the way. Thanks again for the opportunity! I would make so many cute adorable outfits for my nieces. Thank you for the chance!!!! I would LOVE LOVE LOVE a GO! Baby Fabric Cutter! It would be nice to have because it would travel easy, I like that. I would definitely make some of the applique shirts for my daughter. That bird is too cute! I would make a quilt for my newest nephew, and some appliqued shirts for my niece! This is so neat. I would use it on my girls clothes, and for my little guy, baby gifts too! I’ve wanted one of these for a while-I’d make appliques and cut hexagons for english paper piecing. I am a follower on facebook. I know I have problems cutting but the sewing is easy. I can’t wait to win…I will be making cute shirts for my adorable granddaughters! I would try applique on quilts and clothing if I won. Thanks for the great giveaway! I am following your blog as kymama. I would use the go baby cutter to embellish all the little girl things that need embellished! I would also use it to decorate up my reusable gift wrapping (vs. traditional wrapping). Love the website p.s. I made two of those pumpkins…they didn’t turn out as nice but my husband thinks they are great. I would love to make some baby quilts that I could embellish with applique. There are three women in my Bible study group who are pregnant. I think it’s time to get quilting in a hurry! I would love to win the GO! Baby Fabric Cutter to make cute things for my little ones – ages 23 months and 7 months. Wow there are so many comments already!! chances are slim, but it’s worth a try…I love applique and the Baby Go! would definitely speed things along, especially when pushed for time. Thank you for this wonderful opportunity. I have already signed up for all the other opportunities to win this as well. I would finally dive into quilting! I’ve been put off by the repetitive cutting. I signed up to get the Accuquilt patterns. I would use love to use it for my own sewing applique projects as well as use it to make projects with my girl scout troop. What a great giveaway! I would use it to cut appliqué shapes for my quilts. It looks so cool 🙂 Thanks! I signed up for the free patterns from accuquilt as well. Thanks so much! i would use this to make quilts, pillows and some applique for my girls’ shirts. Thanks!! Holy Smokes! I’ve been trying to enter this giveaway from my droid phone on vacation all weekend (with no luck) and am so glad I didn’t miss the deadline now that I’m back home! I’m a FB follower! If I won the GO! Baby Fabric Cutter I would absolutely use it to make a new quilt out of my vintage fabric collection. Thanks for posting such a great giveaway during your new baby nesting time! OMG! I have seen these all over the blogosphere and really think I need one! But it’s one of those things that I can’t see spending the money on myself for. I’m expecting a baby boy in February and have started on my sewing. This would certainly come in handy to add that extra something special to all the pieces I’m making!! Love it!!! I’ve followed your site for a few months now! Love it!!! I’m a follower on Facebook!!!! I’m already signed up with Accuquilt!!!! I like The Cottage Mama on FB. I will use the Go to do appliques on clothing and blankets for my boutique! I love the Go Baby and would make personalized and appliqued baby quilts with it. I also would love to make the appliqued t shirts like you made. I receive the accuquilt newsletter and patterns. I was so excited when I saw this giveaway! This is at the top of my “needs” list:) Thank you for hosting such a great giveaway! I have signed up for 22 free patterns from Accuquilt. Can’t wait to download them! This cutter has been on my wish list for a while! I can think of endless possibilities, quilting and embellishing, pillows..clothing…dish towels…tote bags…! Thanks for the chance to win! and i’ve signed up for the free patterns from Accuquilt! I have been dying to make a Drunkard’s Path quilt and would love the GO! Baby cutter to help me with that project! I’ve Liked you on Facebook too! And…I’ve signed up to receive 22 Patterns from Accuquilt! Thanks for the chances! I’d make appliques for my little girl’s skirts, tops, etc. How fun! I really want to make a HST quilt and the Go would cut all those pesky points off! I’m a new follower. Thanks for the giveaway. I’m already signed up to receive the patterns. I have a little boy, but I would SO make onesies (for a future little girl :), or as gifts for friends’ children), t-shirts, quilts, framed art..ohhhh the possibilities are endless!! I would make dozens of t-shirts for my 3 girls ages 10, 8 and 6! Thanks for hosting this wonderful giveaway! I’m a new follower to your blog. If I were lucky enough to win I’d use the fall medley to make tea towels. Fall is my absolute favorite season. Thanks for hosting this wonderful giveaway! If I were lucky enough to win I’d use the fall medley to make tea towels. Fall is my absolute favorite season. I would use it to make quilts. Thanks for the opportunity to enter your give away. Robert in northern Iowa. I’m a new facebook fan yeah!!! In 19 days i will be anew mommy and can’t wait to meet my LO. If I were to receive this wonderful machine i would use it to create appliques to cover stains on all the hand me down onsies i received from friends and family…. thanks for the chance to win!!! I just became an e-mail follower. Would really love to have a fabric cutter. Thanks. I would use it to make applique pieces for totes. The ideas are endless. I would use it to create lovely new quilts! This would be so awesome to get!! It looks amazing!! Thanks so much for the giveaway! I know I would definitely use it to make some fun shirts for my boys! I would love to try making a Drunkard’s Path quilt – the Go makes it look so easy! I would make some clothing for my two sweet baby girls. I am a facebook fan of The Cottage Mama!! I signed up for the free patterns! Thanks!! I follow you on facebook and your blog as well. I enjoy reading your post!!! I love to applique and this little baby fabric cutter would be so handy. I can see it used in the collage work I do on little girls dresses and hand towels. It would be great to decorate t-shirts for my 2 grandsons, too. We just found out we are adding a Little Lady to our roster. I would use this bad boy to deck out our Little Mama in some super savvy onesies! I became a fan on Facebook!! I would use the Go Baby to make my new jewelry designs I am starting but I can think of a hundred different uses. I am now a follower of the Cottage Home!!!! cutting is the part of sewing that I don’t like… I would use it to cut things for quilts, appliques, and BINDING STRIPS. I reallllly don’t like that part of cutting fabric! 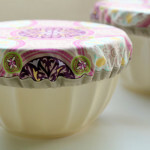 such a time saver for fabric loving sewer! FB follower:) love your FB feed… an easy way to keep up with your awesomeness!!!! I have always dreamed of having an accuquilt fabric cutter. All of the quilts that I have done have been made of thousands of tiny triangles and squares, and it would not only make cutting the pieces so much easier, but more accurate and make a better quilt top. I am absolutely in love with quilting, and having a Go! Baby would make it so I can spend more time quilting than cutting up fabric. 😀 I’ve also always wanted to try applique, but never wanted to spend all my time cutting out shapes. Cutting is my least favorite part haha. I signed up to receive the patterns from accuquilt. I would use this machine to make the items I sew for my granddaughters more unique. Requests for quilts are coming my way and this could help me make each quilt special! I would make appliqued shirts for my kids. I have wanted one of these forever. Thanks. I would make a hexagon quilt! Love your t-shirts you made! I can see so many projects to use this machine – but I think I’d start with some bows and then a cute appliqued apron. This would be so cool to win! I would love to applique more clothes for my girls, but my hand-cutting skills are terrible. A Baby Quilt for New Grandchild due in April!! Oh yes, I am a Happy Blog Follower of yours by email, and GFC!! Thanks Lindsay for the chance at such as Awesome Give Away!! If I was the lucky winner I’d love to make a quilt with the Drunkard’s Path. I’m a follower of The Cottage Mama’s blog. I have already signed up for Accuquilt’s newsletter and received my free 22 patterns. I definitely would make some pillows! I am a follower of the Cottage Mama blog and I really love your blog Lindsay. Would so love to win this and yes, I did sign up for the 22 free patterns thru accuquilt. I am a fan of the Cottage Mama on Facebook! Ooooh, what WOULDN;T I make with one of thse babies?! Quilts, bags, appliques, I want one of thse muchly. Thanks for the giveaway! I have been a facebook fan or yours for a while, and its how I keep up with all your great giveaways like this one! Oh my goodness…the possibilities are endless! Would most likely use to embellish clothing for my kids. I would make baby quilts for my little one and all my friend’s babies too! yay! I signed up for the accuquilt free patterns! I would make baby quilts, tapestry and maybe be brave enough to attempt to make cute t-shirt like the ones you made. they are super cute. thank you for this amazing giveaway. I am a happy subscriber of accu cut and already have 22 FREE Patterns from Accuquilt. I would probably make lots of ruffles or yo-yos. I am signed up for the free patterns.